Wanda Flanagan welcomes strollers to her Sisters on the Fly trailer. It’s the Holiday season … that time of year when our hometowns are busy with school music concerts, Christmas pageants and all types of special events. I always look forward to the local craft fairs, enjoying the unique folk art and ever intriguing craftsmanship of people. It never fails I’ll find some item that makes a perfect gift to put under our Christmas tree. I love too the decorations that fill the shops and the holiday music drifting through the air. It’s always such fun, when driving home after dark, to see the lights folks put up to transform their houses into twinkling fairylands. My rural town hangs red-ribboned wreaths from the light poles along main street and store windows are painted with reindeer ’n Santa or red and green dressed elves wrapping presents. In 1999, two real-life sisters started the group, which grew from a dozen members who met in Montana for fly-fishing, to now more then 3,000 women all over the United States and Canada. Each owns a vintage trailer and equally interesting story about their trailer’s history. Becoming a Sister is not difficult … you don’t have to fish and you don’t have to ride horses and you don’t have to own a trailer BUT you do have to live by the Sisters motto: “We have more fun than anyone!” The motto is definitely reflected in the uniquely named and decorated vintage trailers, lovingly restored by each lady whose ages range from 20 to 90 and backgrounds vary as much as the trailers themselves. Sisters love an excuse to share their little “homes on the road,” whether it’s caravanning to a spot for camping or the many planned SOTF events all over the country every year. In addition to the fun events, Sisters on the Fly also help raise money for Casting for Recovery, the non-profit which sends women recovering from breast cancer to fly fishing camp. Here they have fun and learn how to cast a fly rod. It’s been medically proven this arm-motion helps in their physical as well as mental rehabilitation. Being a Sister myself, I was delighted to haul my own trailer “Tin Tipi” to Red Lodge, along with eight other SOTF members of the Northern Rockies chapter. Up and down the street hundreds of people sampled food and warmed their hands by the bonfire-pits, while bag pipers filled the air with favorite Christmas carols. 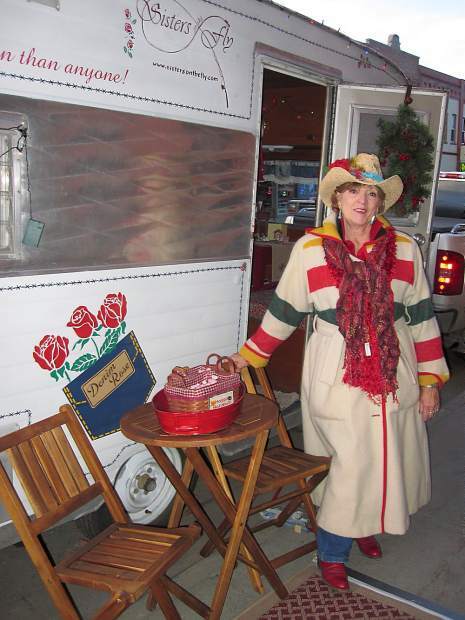 We ladies decorated our trailers, inside and out, in twinkling lights, tinsel and Christmas cheer. The merchants and strollers said they loved the Sister’s lighted trailers … such a fun addition to the Stroll. I heard many a story of remembered family camping adventures while folks stepped inside my vintage 1970s Caveman trailer. My absolute favorite was from one gentleman who told me he’d camped in a similar type trailer at a campsite known for bears breaking into camper’s tents and trailers.